I am so sorry it has taken me so long to get back with you regarding our trip to Chiang Mai Thailand! We had a wonderful time! Everything you did for us was excellent, and the trip went so well. We loved the hotel, and the guides and how everything went. Thank you so much, and for working with me over such a long period of time. It was everything we had dreamed of and more! just a note to say hi to you and to wish you and your family, an Happy Easter . the trip your organized us in Thailand was great, we had a very good time. The hotel was located in a great position, right on one of the most beautiful beaches of that area. The place is quite and very comfortable. Most of customers are from north of Europe (Sweden, Norway, Denmark), so everything is clean and well organized. During the pick season, Kids are not allowed if they are not 16 years old, so you can really relax at any time of the day. You can rent bike or motorbike to go downtown that is only a few kms. From the hotel. Your choice has been outstanding. Thank you very much for making this trip the best of my life. Excellent service. South East Asia discovery 14 days 13 nights”. From 25th Dec 2016 to 7th Jan 2017. Happy New Year and hope you are doing well. We wanted to provide you customer feedback on our recent holiday visit to Bangkok. Our tour guide Miss Sandy was excellent and went over and above to make us comfortable and happy on our brief visit. We would highly recommend her to our friends and family visiting Bangkok. We also recommend our driver who was very hard working and made sure we were on time for most of our visits despite the extreme traffic in Bangkok city proper. We hope this feedback is helpful for you and for your clients. I arrived safely. Thank you for all your effort and professional work. I will surely be using your services again. Happy new year to you too. I want to thank everyone at Travel Thailand and Travel Cambodia for a fabulous trip. We had a fabulous time! Kik and Ngo were incredible. They were so helpful and so much fun to experience Thailand with. We were delighted when we returned to Bangkok and found Kik waiting for us. Hun, in Siem Reap, was a great guide. He was knowledgable about not only the ruins but the entire area and it's history. Our hotels were all fabulous. The small boutique hotel in Siem Reap as well as the hotel in Chiang Mai were excellent location from which we could do our own exploring during our free time. Koh Lanta's Twin Lotus was perfect....close to town, close to a variety of restaurants, and the service was excellent. We had no disappointments on our trip other than the fact that we had to return home. I hope we have the opportunity to again travel with Asia Travel & Leisure. We will definately recommend it to our friends. I have already passed it on your company info to a fellow tourist I met while in Cambodia. Chiang Mai vacation 4 days 3 nights from 1st Oct 2016 to 4th Oct 2016. Receive my apologize that I didn’t send any message after we have safely arrived back home. Usually the working days after the vacation are the busiest days at work. Anyhow, we had great vacation. We had enjoyed a lot in the both countries, they have similarities and huge differences at same time. We enjoyed the nature, amazing historical places, friendly and smiling people, massage, and definitely the best night life and entertainment in Bangkok, especially for the male part of the group. And thank you for organizing this trip for us and specially thanks to your representative in Bangkok for her extremely efforts to find the Vietnamese coffee which I am enjoying with my wife while sending you this email. I will fill in the survey soon. 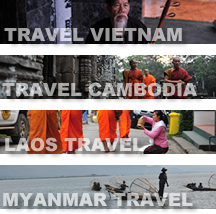 Whenever we decide to visit Southeast Asia again, definitely will request your services. Everything is excellent! Is our third travel with you!!! Our great agent Ms. Mary D is an angel, she is an hard worker!!! Thank you for everything!! it was wonderfull!!! About our tour guides they were all great!, Tola (Cambodia) was great!!! he is a true photographer so we took with us lots of excelent shots from the ankor watt!!! It was really a plus!! Luang Prabang was beautifull! it was really a shame that we loose that one day. The only thing we thought that can improve is the visit to the elephant camping... our tour guide in Chiang Mai told us there were only two options, that they were exactly the same activities, but one was one hour further, so we took the other which she insisted. Later on some friends told us that the other one is better, that you can bath the elephants, ride them with out a chair (so the elephants didnt get hurt) that they were unchained... and more. We would have liked that the guide to told us that information! Thanks again and if we can give you any further feedback, feel free to ask! Just a little note to say THANK YOU and well done for organizing our trip so nicely and efficiently. Communication wirh you has been great and the trip has gone as smoothly as it could be. The activities have been just perfect and the guides as well, specially in Bangkok. Mr Ekapong was always punctual and gave us lots of information about the city, the culture and the country. Thank you as well for getting us a late check out at the hotel tomorrow. I will recommend you with no doubt! I thank you very much for the trip. I have travelled before in the same way (with a driver and a guide) in the last years and I recognize the quality of your service (this was my third travel in your area, the south-east Asia). I will surely suggest your agency to my friends, collegues and partners if they wil decide to visit your wonderful country (they have seen my pictures and they think Myanmar is one of the most beautiful place in the world). • Some hotels, as I wrote on the questionnaire, didnt give the quality of the service we guessed. This is not a big problem, I am used to travel and I know that sometime this thing can happen. For ending, the guides and the drivers have been very serious and professional. The choice of the plan was well decided and so the time and the way to transfer from a place to the following. If you want, I can send you some pictures of the journey for your website. Wish you a good job and good luck. Thank you for our trip. We are having a great time. We are pleased with everything and I would like to congratulate you for Kris – our tour guide, he did really well. Mr. Edgar Bonfante & Family from Mexico. I just wanted to thank you for organizing such an excellent trip for my husband and I. It was so very well organized and professional. I am amazed that it ran so smoothly without any problems, especially as we stayed in 16 different hotels (or trains) and had 6 flights to contend with. So thank you for doing an excellent job putting it all together. Ms. Ann CARROLL & Mr. Micheal CARROLL from Canada. I had a wonderful time in Thailand and I would like to thank you for everything. I am sorry for the delay but I was very busy the last months. Thanks a lot. I will get back to you when I will be travelling in Asia next time. We arrived home safely, after our great time we all had in Thailand, thanks to you and all the team that was involved in the operation. I am very satisfied and more than happy I decided to do the trip with your company. I am sure that in the future we shell do the same with you, hopefully next year.